Lary R. Smith was born on April 24, 1942 in Plymouth, Michigan. He received his Bachelor of Arts degree in teaching physics from Kalamazoo College and obtained a Master of Science degree in theoretical mathematics at The Ohio State University. He also took course work at Wayne State University and other universities, including the University of Glasgow, Scotland. After graduating he taught math and physics in the Warren Consolidated School District and in the Livonia Public Schools. In 1970 he became the Livonia Public Schools’ Computer Specialist and then joined the staff of the Wayne County Intermediate School District (now Wayne County Regional Educational Service Agency-Wayne County RESA) as its Computer/Technology Consultant. After retiring in 1999, he started EdTech, LLC, a consultant firm that helps local school districts make the Internet accessible to students. He was raised as a Master Mason on May 24, 1974 in Plymouth Rock Lodge No. 47. Over the next few years he assisted as an advisor to the Plymouth Chapters of Rainbow and DeMolay. He served as Worshipful Master in 1979-80 and again in 1989-90. In 1992 he was elected Lodge Mason of the Year and was also awarded District Mason of the Year. He joined the Plymouth Chapter No. 115, Order of the Eastern Star in 1976 and in 1980-81 while serving as Worshipful Master, served as the Chapter’s Worthy Patron. In 1978 he was elected to the Plymouth Rock Masonic Temple Association and served as its Secretary until 1995. In 1989 he was elected Secretary of the Masonic Masters’ Association. He served for over 20 years in that position. In 1995 he became a plural member with Britannia Lodge No. 601 and served as its Secretary from then until 2001. In 1978 he joined the Plymouth High Twelve Club No. 64 and served as its President several times and is still a member of Redford-Northwest Club No. 14. He has served on the Grand Lodge’s Computer Committee since 1994, has been a Grand Representative to the Grand Lodge of Uruguay and, more recently, to the Grand Lodge of Rhode Island, served on the Masonic Foundation of Michigan, Inc. and was appointed in 1998 as one of nine Grand Master’s Representatives in the State of Michigan. He has been a member of the Quatuor Coronati Correspondence Circle in association with Quatuor Coronati Lodge No. 2076, the premier Lodge of Masonic Research in London since 1994. He is also a member of the Michigan Lodge of Research and Information No. 1., the Scottish Rite and York Rite Bodies. 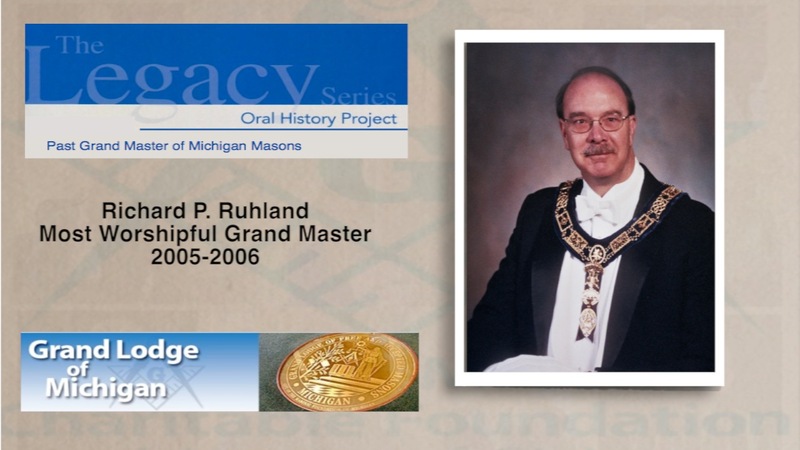 He was elected Worshipful Grand Marshal at the 1998 Annual Communication of the Grand Lodge in Grand Rapids and was duly elected and installed as the Most Worshipful Grand Master of Masons in Michigan at the Annual Communication held in Acme, Michigan in May 2003. On July 29, 2003, Most Worshipful Grand Master Lary R. Smith presided over a crowd estimated at more than 500 people to help dedicate the new John C. and Velma Doig Community Conference Center on the campus of the Michigan Masonic Home in Alma, Michigan. His term ended in the closing hours of the 178th Annual Communication in May 2004, in Grand Rapids, Michigan. Donald J. Van Kirk was born on January 6, 1935. When he was seven years old, his family moved to Dearborn. He graduated from Dearborn High School and received a two year associated degree from Henry Ford Community College. He served in the U.S. Navy and continued his education as the 1st Class Recruit Education Petty Officer at Great Lakes, Illinois and graduated at the top of his class at the Electronics School. He completed several courses through the U.S. Armed Forces Institute and passed the Federal Communications Commission Examination for a first class Radio-Television Operators license. He attained the rank of 2nd Class Petty Officer before his honorable discharge from the Navy after four years of service. He married Wyva Moore on April 28, 1956. They were blessed with one daughter. He received his Electrical Engineering Degree from Wayne State University, a Masters Degree in Engineering Mechanics, and a Master’s Degree in Finance and Management from the University of Michigan. He is a registered Professional Engineer in Michigan. He was employed by the Ford Motor Company in special Vehicle Engineering for twenty years before his retirement in 1985. He established his own Forensic and Consulting Engineering firm. He has been a member of the Society of Automotive Engineers for more than twenty years and has served on their Biomechanics Subcommittee. 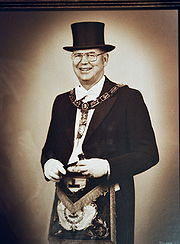 He was duly elected and installed as the Most Worshipful Grand Master of Masons in Michigan on May 30, 1996. During his term of office he dedicated the John C. and Velma Doig Chapel and Education Center at the Michigan Masonic Home in August 1996. He also dedicated the new public library in Lowell, Michigan. Robert W. Sanborn was born in Geneseeville, Michigan on February 10, 1929. His family moved to Clio shortly after his birth. He graduated from Clio High School and started his own retail gasoline business at the age of 19. In 1952 he changed to the wholesale petroleum business and owned the Sanborn Oil Company in Clio. On April 2, 1950 he married Donna Jeanne Scott. They were blessed with three sons and a daughter. He was raised as a Master Mason in Vienna Lodge No. 205 on January 30, 1951. He was duly elected as Worshipful Master in 1958. He was an officer for 30 years and was Treasurer. He was the Chairman of the Dedication Ceremonies of Clio’s new Masonic Temple in 1969. He served as President of the King Solomon’s Club in 1961. In Grand Lodge, he served as Representative to the Board of General Purposes District No. 20, in 1969 and was President of the Board of General Purposes from 1973-1974. He is a member of Flint Rapids Chapter No.116, R.A.M. ; Genesee Valley Commandery No. 15, K.T., Flint; Flint Council No. 56, R. & S.M. ; Flint York Rite College No. 5; Ancient Accepted Scottish Rite 32° Valley of Bay City; Elf Khurafeh Temple A.A.O.N.M.S., Saginaw; received the York Rite College Gold Honor Award in May 1972; Order of the Purple Cross York Rite College; Worthy Patron, Vienna Chapter No. 283, 1964-1965; Mallet Club of Michigan; Vehicle City Masonic H-12 No. 673; Honorary Memberships in Salyersville, Kentucky Lodge No. 769; Honorary Memberships in 13 Michigan Lodges; Member of St. Martin Conclave Red Cross of Constantine; Honorary 33° Mason; Served as Commander-in-Chief of the Bay City Consistory 1997-1999. He was with the Clio Area Fire Department for 25 years, and retired as Fire Chief in 1980. He served the Township of Vienna in various positions for 42 years. He was a member of Bethany United Methodist Church, served as Chairman of the Trustee Board, Chairman of Administrative Board, Superintendent of Sunday School and served as head usher, Boy Scout Troop No. 201, and an Honorary Kentucky Colonel. He retired after 50 years in business in Clio. 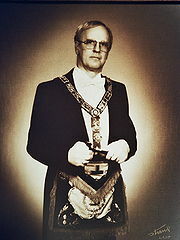 He became Most Worshipful Grand Master on May 26, 1982. He also served as Right Worshipful Grand Treasurer from 1983-1989. Richard Patrick Ruhland was born on September 29, 1950 in Denver, Colorado. He spent his formative years there. During his junior year of high school his family moved to New Jersey. Immediately after graduation from high school the family moved to Michigan. He attended Oakland Community College and majored in Business. He received his Bachelor of Science Degree in Business Administration from the University of Phoenix. He married Pat Cusac in Detroit, Michigan in July 1972. They were blessed with a daughter and a son. Advancing on a career path in the restaurant field he worked his way into various management positions with local restaurant chains. In 1977 he began a career with the General Motors Corporation as a First Line Production Supervisor. After a series of promotions, he moved into his current position as senior Manufacturing Engineer at the Powertrain Manufacturing facility in Ypsilanti, Michigan. He became interested in Masonry because of his attendance during a 1991 Shrine parade in Phoenix, Arizona. He was impressed with the membership’s interest in children. He was raised as a Master Mason in Wayne Lodge No. 112 in Westland, Michigan on April 25, 1992. He served his Lodge as Worshipful Master in 1999 and became a Pre-Paid member in 2001. 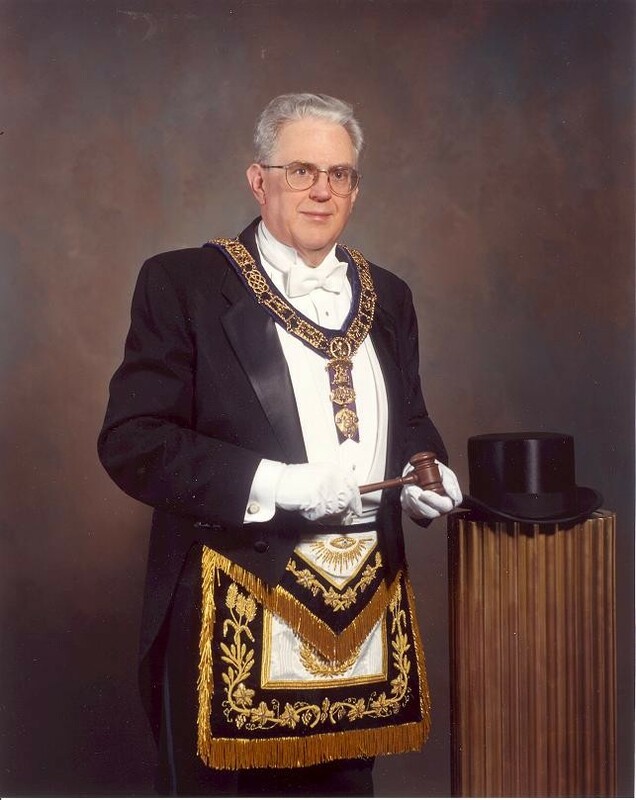 He also served as President of the Masonic Masters Association of South East Michigan in 1999. 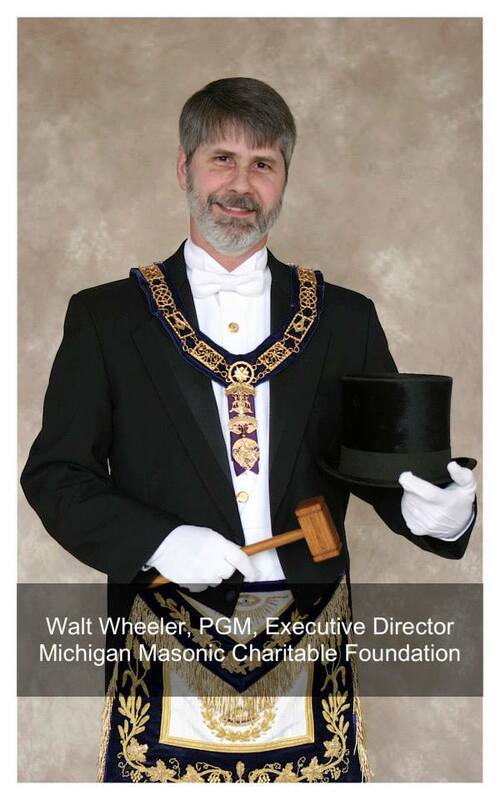 In search of further light in Masonry, he joined Wayne Chapter No. 182 Royal Arch Masons, Northville Council No. 30 Royal & Select Masons, Northville Commandery No. 39 Knights Templar, Ancient Accepted Scottish Rite Valley of Detroit, Moslem Shrine A.A.O.N.M.S., Nankin Chapter No. 238 Order of the Eastern Star, York Rite Sovereign College of North America, Prince Edwin No. 8, Crusader Council of Allied Masonic Degrees No. 142 and is a plural member of Britannia Lodge No. 601. He has the extreme honor of being an honorary member of Lake City Lodge No. 408, Waybon No. 305, Saline Lodge No. 133, Garden City-Builders Lodge No. 587, Buchanan No. 68, and Union of Strict Observance No. 3 and High Twelve International Mid-Michigan Club No. 602. With extreme pride he received the DeMolay Honorary Legion of Honor and was commissioned with the Title of Knight Commander of the Temple from the Grand Encampment of Knights Templar of the United States and the Rainbow Grand Cross of Color. 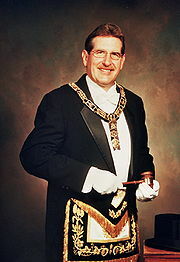 He was duly elected and installed as the Most Worshipful Grand Master of Masons in Michigan on May 26, 2005. Grand Master Ruhland is a planner, organizer, and in some respects a futurist and takes great pride in bringing ideas and projects into fruition. He feels his Masonic affiliation has given him the opportunity to utilize his skills in these areas to further benefit this fraternity. He is humbled by the outpouring of support from all the men and women of this great Masonic family. During his term of office he rededicated the Masonic Health Care Center in Alma on July 20, 2005. It is now called the Jack F. Sanders Health Care Center. He also developed the new Masonic Festival at the Michigan Masonic Home in Alma. He introduced the MI CHIP, Michigan Child Identification Program and the Pocket Petition. Also, a decision was made by the Grand Lodge Board of Directors to move the Grand Lodge office from Grand Rapids to Alma. It was dedicated on January 28, 2006. Throughout his term, he spearheaded the following initiatives: 1) he worked with Grand Lodge Officers and others to merge the Michigan Masonic Home Charitable Foundation with the Masonic Foundation of Michigan, Inc.; 2) he organized and led a drive to seek property tax relief for Michigan Masonic Lodges; 3) he helped raise $10,000 in sponsorships for the 2006 Grand Lodge Golf Outing; and 4) during his watch, he helped to recruit fifty-one new members of the Lewis Cass Society. The members of this Society pledge assets in their estate plans to the Masonic Foundations. His term of office ended in the closing hours of the 180th Annual Communication in Grand Rapids, Michigan on May 24, 2006. Most Worshipful Brother Michael J. Jungel was elected Grand Master of Masons in Michigan at the 182nd Annual Communication held at the Detroit Masonic Temple in the City of Detroit on May 31, 2008. Mike was born July 3, 1946 in Paw Paw, Michigan the eldest son of Warren Michael and MaryLou Jungel. He spent 38 years in law enforcement retiring as Deputy Chief of Police for the City of Portage. Upon retirement from Portage he was hired to develop a police agency and assist in development of the criminal justice system for the Pokagon Band of Potawatomi Indians, where he retired in 2007. He was a Michigan State Police Basic Academy graduate as well as a graduate of the FBI National Academy. He also attended Kalamazoo Valley Community College and Western Michigan University. Most Worshipful Brother Mike joined Brady Lodge #208 (now Portage-Brady #340) in 1985 and served two years as Worshipful Master. He also served several years on the Vicksburg Masonic Temple Association. He is a member of Michigan Lodge #1 of Research Kalamazoo Area Masonic Retirees and an Honorary Member of St Albans Lodge #20, Buchanan Lodge #68 and Montrose Lodge #428. Most Worshipful Brother Mike is a member of Loyalty Chapter #497 Order of the Eastern Star. In the York Rite, he is a Past High Priest of Kalamazoo Chapter #13, Royal Arch Masons, Past Thrice Illustrious Master of Kalamazoo Council #63, Past Commander Peninsular Commandery #8, and Past Governor of Western Michigan York Rite College #10. He served, as Grand Prelate for Grand Commandery in 2002-2003. He is a holder of the Grand Knight York Cross of Honor and the Order of the Purple Cross. He is also a Past Sovereign Master Marcellus Council Allied Masonic Degrees, member of the Holy Royal Arch Knight Templar Priests and St Vincent’s Conclave, Red Cross of Constantine. Most Worshipful Brother Mike was elected and served as Grand Master of the Grand Council Royal and Select Masons in 1994.He is a member of the Valley of Grand Rapids Ancient Accepted Scottish Rite and served as Most Wise Master of Robinson Chapter of Rose Croix in 1998- 2000. He served on the Children’s Learning Center Board of Governors as a member and one term as chairman. He also served on the Board of Trustees a number of years including one term as vice –president and one term as president. He was coroneted a 33rd Degree Mason in Indianapolis Indiana in 2001. He is also a member of Saladin Shrine AANOMS and the Kalamazoo Shrine Club. Most Worshipful Brother Mike and Rosemary are members of Westminster Presbyterian Church in Portage where he serves as an usher and lay reader. Most Worshipful Brother Mike married the former Rosemary Brown in 1966. They have three children Elizabeth, Michael Jr., and Heidi. They also have seven grand children Thena, Clara, Crystal and Ashley daughters of Elizabeth and her husband Robert Johnson and Melissa, Ashley and Tiffany daughters of Michael and his wife Ann. David R. Bedwell was born on September 25, 1955 in Dearborn, Michigan. He graduated from Dearborn High School and attended Henry Ford Community College receiving an Associate Degree in Automotive Technology. He went on to study at the Detroit College of Business. Shortly after receiving his Degree, he began employment with the Ford Motor Company as a Test Technician, and later became an Engineering Design Technologist working in Powertrain Operations. He continues to work for the Corporation. He married Pauline M. Werth on July 26, 1980. They were blessed with a son and a daughter. He joined the Boy Scouts of America as a Cub Scout and continued into Boy Scouts where he received the God and Country Award and the Eagle Scout Award at age 14. He was raised as a Master Mason on February 20, 1989 in Dearborn Lodge No. 172, F. & A.M. In 1995 he served his Lodge as Worshipful Master. In 1997, he was elected Lodge, District and State Mason of the Year. He was elected Worshipful Grand Marshal in the same year. He holds honorary memberships in Lake City Lodge No. 408 and in Golden Ark Lodge No. 595. His other Masonic affiliations include the Ancient Accepted Scottish Rite, Valley of Detroit, Dearborn Chapter No. 172, R.A.M., Redford Commandery No. 55, K.T., St. Clement Conclave, Red Cross of Constantine, Thistle and Rose Council No. 27, A.M.D., Ahmed Temple, A.A.O.N.M.S., and the Michigan Lodge of Research and Information No. 1. He served as President of the Detroit area Masonic Masters Association in 1997, and in 1996 was appointed Grand Representative to the Grand Lodge of Manitoba. For his distinguished service to the Craft, he was Coroneted a 33º Mason on September 23, 2003, in St. Louis, MO. He continues to be very interested and involved in Masonic Renewal at a state and National level. 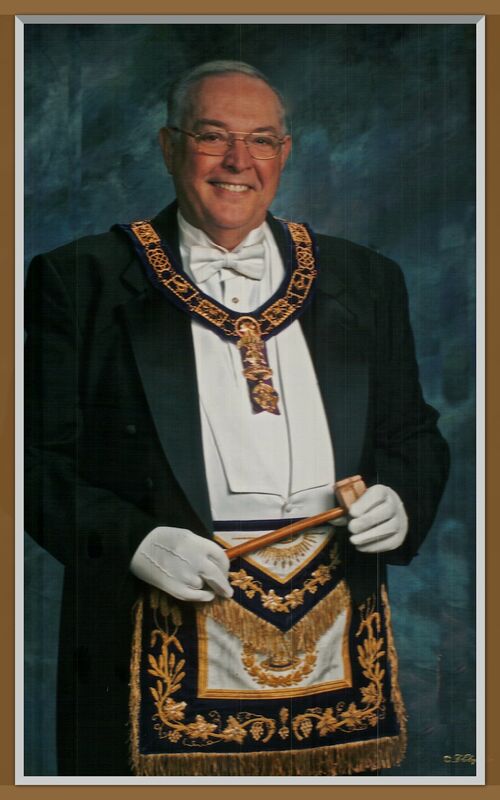 He was duly elected and installed as the Most Worshipful Grand Master of Masons in Michigan on May 31, 2002. During his term of office he developed and led a one-day program to raise Master Masons. The program held at five Masonic Centers was a success and raised over 500 Master Masons. Richard H. Sands was born on September 28, 1929 in San Diego, California. He moved with his family to Crestline, a small community in the San Bernardino Mountains. He graduated from San Bernardino High School in 1946 and started a career as an apprentice die maker. He continued his apprenticeship while attending the University of Redlands, where he graduated in 1950. In 1954, he graduated from Washington University in St. Louis with a Ph.D. Degree in Physics. While attending Redlands, he met Emma Grace Allen of Bakersfield, California. They were married on August 11, 1951. They were blessed with four children. After coming to Michigan he joined the faculty of the University of Michigan in 1957 and became a Professor of Physics. He served as Chairman of the Department of Physics for five years. He has been an active research professor, supervising doctoral theses of eighteen Ph.D’s, two in biophysics and sixteen in chemical and atomic physics. He taught and directed several Academic Year Institutes for High School Teachers of Science to introduce them to forefront areas. In 1981, he participated in a mini-course entitled, “Physics and Ethics” and gave two lectures. One was published in the Michigan Quarterly Review under the title, “Physics, the Royal Society and Freemasonry.” It was this article that earned him the 1981 Certificate of Literature Award from the Philalethes Society. Richard H. Sands was raised as a Master Mason in Golden Rule Lodge No. 159 on March 12, 1964. He served as Worshipful Master in 1971. He is also a plural member of Livingston Lodge No. 76 in Pinckney. He was appointed to the Grand Lodge Masonic Service and Education Committee while serving as the Worshipful Master of his Lodge. 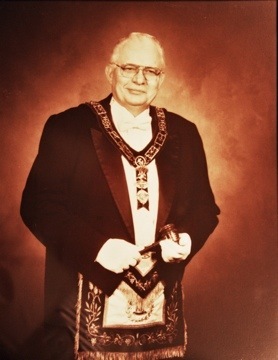 Under his chairmanship, the Committee developed “Planning for the East,” “A Lodge System of Education,” “The Intender Handbook,” “The Wardens Workshop” and “From Point to Pointe.” On May 30, 1985, he was duly elected Most Worshipful Grand Master. He is an Honorary Member of nine Masonic Lodges in Michigan. He is also a member of Washtenaw Chapter No. 6, R.A.M. ; Ann Arbor Council No. 86, R. & S.M. ; Ann Arbor Commandery No. 13, K.T. ; Jackson College No. 3, Y.R.S.C. ; Scottish Rite Bodies, Valley of Detroit, where he served as Thrice Potent Master in 1983-84 and was a Trustee; Ann Arbor Chapter No. 122, O.E.S. ; Washtenaw High Twelve Club No. 498; Zal Gaz Grotto; Moslem Temple Shrine; Grand Master’s Council “A” Allied Masonic Degrees; Fellow, Grand College of Rites; Provincial Grand Lodge, R.S.Y.C.S. ; and Provincial Grand Chapter, H.R.M. of K.I.W.N.G. ; Royal Order of Scotland; and St. Clement Conclave, Red Cross of Constantine. He is also a member of several Masonic Research Lodges, including the Michigan Lodge of Research & Information No. 1. He served as President of the Midwest Conference on Masonic Education in 1978. He is a Fellow of the Philalethes Society, which honored him in 1981 with its Certificate of Literature Award.